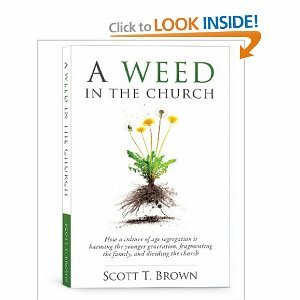 A Weed in the Church: How a culture of age segregation is harming the next generation, fragmenting the family and dividing the church. “There is a crisis among the Christian youth. They drop out of church. They remain childish. They are biblically illiterate. The church is losing the next generation. What’s the answer according to Scott Brown? Stop age-segregation and start age-integration (especially get the fathers involved). As a former youth pastor, I completely agree with Scott Brown. This is a huge step in the right direction of restoring the biblical values for church and family. My only concern is that it doesn’t go far enough. In the New Testament, families didn’t “go” to church together. Rather, it was understood that the home, and not some church building was the center of spirituality. In other words, the marriage, and then the family, was the first and most foundational expression of church. This is a biblical value that the LK10 Community is seeking to restore. Coming in January, a new course called “The Family Blessing: Reclaiming the Home as the Center for Spiritual Training”. As a parent of 5 child ages 12 to 20 I couldn’t agree more!!! My husband and I have said that the traditional church as we know it has always split the family by all the different “programs” they put in place. We have never sent our children to “youth groups” as we never felt that it was the best place for them. What about youth ministry for the “unchurched” in highschools and juvenile detention facilities? Kids that don’t have families or examples of a good home church?? Could or should a youth minestry take on more of a “house church” look and feel? Good questions, Greg! I don’t think that this means that there are no youth oriented activities. Rather, it means that the primary focus is on the home and especially on the dads. So, group activities would be facilitated by the dads (and moms). Unchurched kids would be invited into families where they could be discipled by healthy parents. Lots of room for creativity once we have the basic values in place. I would have to balance a view between Greg’s & John’s. I think that the organic/simple church stream is going to approach this issue a littler differently anyway, but of course the church in general — in all it’s forms — is facing great challenges. I worked as a youth evangelist for a large urban ministry. Families on a regular basis took in fatherless teens. Despite the programmatic model of the church, the cultural ethos was one of spiritual parenting not unlike what we would hope to find in an organic/simple church setting. In fact, I think part of their great success has been the intentional & natural emphasis on investing life-on-life even in the midst of lots of activity. However, the needs & the challenges far outweigh the availability of spiritual parents. I could easily have 50 middle school age teens in one room equally hungry for spiritual parenting (without even trying very hard), I had teens in my home every week and usually multiple times a week, and most of the one-on-one time was while driving a church van all over Houston. There are things that I would want to have done better — including utilizing some of the principles that I’ve learned from my deep involvement in simple church experiences. But if a church is going to have a staff, I would still advocate for youth evangelists (I would suggest they are more important than preachers although that certainly upsets the current pecking order!) The need is dire. My experience is not in suburbia; I knew kids that are now dead in the ground without hope. I don’t believe we are able to wait for the ideal — as much as I share the simple church vision to a significant degree. However, simultaneously, I would argue that the way that we have done youth ministry is pretty screwed up. We need heavy integration with the whole church (which my former ministry worked at accomplishing perhaps making it an exception to the rule). I actually think that program-driven churches (which will continue to exist whether or not one thinks they should) ought to exchange the youth minister concept for one of two positions: a) Family coordinates whose role it is to equip families to live out church more fully, and b) A youth-focused evangelist who seeks to reach out to an increasingly unchurched youth culture including integrating youth in inter-generational community as much as possible. The reality is that many parents who are losing their own kids are not in a position to take in more kids from their city. They are working overtime to redeem their own household. However, if more & more families can get through this transition and discover new life together, then we will see an increase in spiritual parenting. At that point, I think that the foundations that John is talking about will be laid firm and will increase our witness in midst of the brokenness all around us. Ultimately, there is going to need to be highly contextualized responses across a variety of places, peoples, and situations. May God help us. Jared, Thoughtful comments as always! Thanks. Clearly, we need to think both short term and long term here. The long term goal is a multitude of healthy households who are living out the values and practices that we are discussing. If that were in place, we would certainly have enough families to reach out to all of the unchurched and largely unparented youth. I believe it was said in the early (Hebraically oriented) church that there was no such thing as an unattached single person. Every single was part of an adopted family. In the short run, I agree with you about the value in program-driven churches for staff positions of Family Coordinator and Youth Evangelists. At some point I noticed that the only mention of a “youth group” in the Scripture was youths who mocked Elisha and died for it. Not the model I’m going for with my kids. I want to disagree with youth programs: Youth evangelism is a disrespect of the young person’s Oikos. It is a trampling of “tribes,languages, peoples and nations”. Extraction evangelism is no more right in the West than “on the field”. The Golden rule means, don’t steal my kid, and I won’t steal yours. Save a kid, and you save a kid, win a family, and you’ve begun a biblically grounded, 100 year movement.